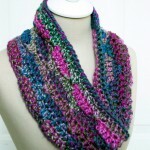 The Luscious One Skein Cowl was a hit, so I decided that with the holidays coming and bulky yarns trending, it was time to make it a set – and then some! So today I’m sharing the pattern for the Luscious One Skein Crochet Hat.. and the matching Luscious One Skein Fingerless Mitts! 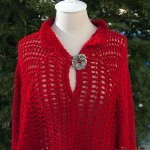 With just 3 skeins of Lion Brand Unique, or the bulky yarn of your choice, you can make all 3 patterns. Pick your favorite 2 for a wonderful holiday gift set, and be the best gift giver ever! 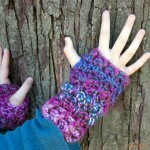 Sized to fit teens to adults, they’re all very quick patterns to crochet, making each perfect for last minute snow storms, craft fairs, and of course, presents! The Luscious One Skein Crochet Hat has two versions – as written it’s slightly slouchy, and very very cozy. This “dangerous slouch” really does use every inch of the skein, so only leave 6 inches or so for a tail at the beginning – and weave it in carefully when you finish up the brim! If you don’t want to risk it, go with the “safe beanie” option, and omit Rounds 9 and 10, continuing with Round 11 as written. This gives you a bit more room to play. NOTE: If you do not wish to use the CSDC, ch 2 and dc in the first st. If you do not wish to use the FDC, you can ch 48 and work a row of dc, but the brim will not be as stretchy. Round 7 – 10: Repeat Rounds 3 – 6, omitting Round 9 and 10 for the “safe beanie” option. Round 17: Work a decrease over the first st and the third st with a CSDC and dc, skipping the 2nd st. *Dc2tog decrease over the next 3 sts by working into the next st, skipping the center st, and working into the third st. Repeat from * to end. Join with a sl st to CSDC. (12 sts) Break yarn and finish off, using this tail to weave the hole in the top closed. 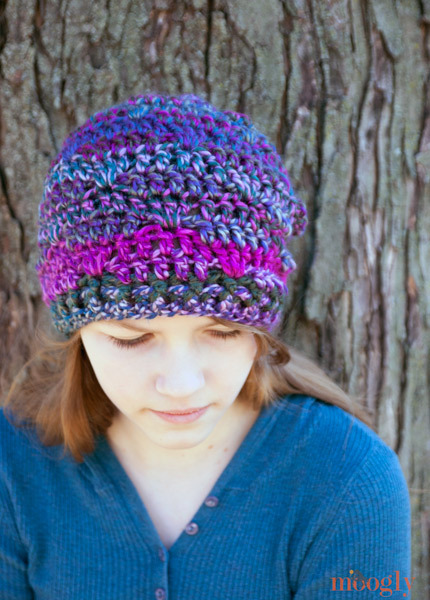 Use the first tail at the start of the hat to close up the brim, as seen in the FDC in the Round video tutorial. And that’s a hat! A one skein crochet hat, to be precise. Perfect for the first (or third) snow of the season, or just keeping the chill of your ears. 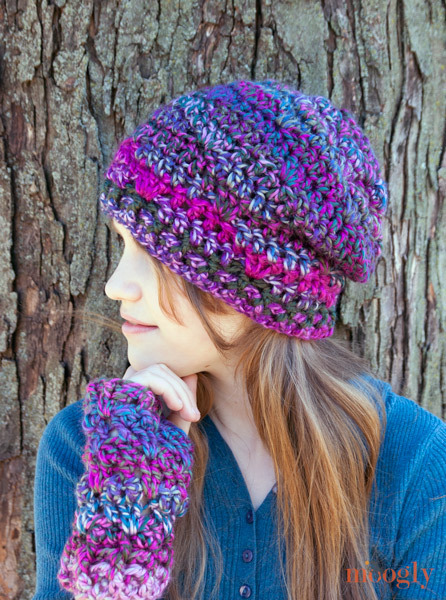 I hope you enjoy the Luscious One Skein Crochet Hat pattern and find a perfect accompaniment in either the cowl or the mitts – or both! Right you are! Thank you mary! I’m usually bit tight of a stitcher, but using a .M 9.0 hook and Loops and Threads Charisma Bulky Category 5, I have a length of 20.5″ at only 38 FDC. Advice pretty pretty please with cherries on top? I’ve been dying to make this hat ever since I discovered it!!! Using a size L 8.0 mm and like the size so far. Round 15 sdoesn’t add up for me I continue to get 20 sts…. Doh! Of course my stitch count was off, I forgot that I started with 40 FDC instead of 48! pattern worked out nicely once I realized my error. 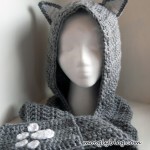 Love the hat, I plan to add a bow or flower and list a project page on Ravelry . I was doing ok untill I got to Round 15 from there things are not working for me. I am giving it a rest for now. If you decide to take it out of time out and are still having trouble I’d be happy to try to help! Thank you think i got it had a friend help. Dyslexia making pattern following ver difficult. I need to make a system that will work for me. Thank god for friends! I’ll add it to the to do list! Thank you Candy! I was doing ok until I got to round 17 is very confusing. I had to guess and do the way I though it should be. I love this hat pattern. I love this hat! I made one for my daughter and I’d love to make one for a 2 year old and a 6 year old. Could you help with how many FDC to start? Thanks! Overthinking round 4…working over the ch 3; do you work into the middle st of the top ch3 or the middle of the bottom slipped stitches. Oh man, I was so close to getting it right. THANK YOU so so much for your quick response!!!! 🙂 Thank you Tania, Happy New Year to you too! This has nothing to do with the pattern… but no joke i look exactly like the girl modeling this hat and these gloves. 😀 That’s my daughter! How funny!